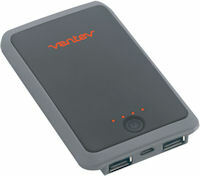 Ventev combines a broad line of mobile accessories with a fun design sense -- particularly combining a slate gray look with signature orange accents. These include cases and styluses, chargers and cables, and earbuds. The chargers include wall, car, and portable models, as well as powercases with built-in battery. However, my favorite is the powercell 5000 battery charger. This is a dual USB design, with a 5 watt / 1 amp port for smartphones plus a 10 W / 2.1 A rapid charge port for tablets. So you get 15 hours of backup power in a unit that is still quite portable at around 4 5/8 x 2 3/4 x 1/2 inches and 5.3 ounces. It's priced at $54.99 (around $34 street). Plus there's the nice design, with the understated slate gray look with non-slip matte surface and gently rounded edges. It's not often that you think about the feel of electronic devices -- but the smooth surfaces of the Ventev designs are particularly comfortable, and a nice match to the thoughtful functionality of these products. For more color, the Ventev chargesync flat USB cables are available in 7 colors, from a matching gray to bright orange or pink. These are 1 meter long, with a flat design that avoids tangling. They're suitable for both power charging and data syncing. The chargesync USB cables are available for Apple Lightning for $24.99 ($20 street), Apple 30-pin for $19.99 ($13), and microUSB for $14.99 ($12). Bluetooth wireless speakers are a great way to share your music by enhancing the sound beyond your smartphone or tablet's internal speakers. However, there's an obvious trade-off between shrinking speakers for better portability versus loudness and audio quality. But the new Jawbone MINI JAMBOX breaks these constraints with impressive sound in a pocketable size. The Jawbone Jambox family starts with the original Jawbone JAMBOX is around 6 x 2.3 x 2.3 inches and 12.8 ounces, and is still available for around $149. And there's the self-explanatory BIG JAMBOX for larger sound (10 x 3.1 x 3.6 inches and 2.7 pounds), for $299. And now there's the MINI JAMBOX, which is around half as thick and 70% the weight of the original (6.06 x 0.96 x 2.28 inches and 9 ounces) -- although you do pay more for the miniaturization at around $199. But you don't sacrifice on performance -- the sound is amazingly clear, with great separation between voice and instruments from the dual front-facing stereo acoustic drivers and passive bass radiator. Plus the battery provides 10 hours of continuous playback, and up to 75 hours of standby. The MINI supports the newer Bluetooth 4.0, so the wireless connection is especially strong and consistent, especially with newer devices. It can pair with up to eight devices, and connect with two devices simultaneously, which means it's easy to share among multiple people. Plus it's a wireless speaker for phone calls, with a 360-degree omnidirectional mic with echo cancellation. While cutting half the width does make the MINI more portable (albeit for larger pockets), the rugged design does mean that it's not featherweight -- It's constructed from a single piece of extruded aluminum for the face and body. This construction also permits Jawbone to play with different looks for the exteriors to go with different colors, so the MINI is available with nine designs -- red, silver, yellow, orange, and green dot, plus graphite facet, blue diamond, aqua scales, and purple snowflake. Jawbone also offers a free app for iOS and Android, including options to customize the controls and enable its LiveAudio 3-D sound enhancement. 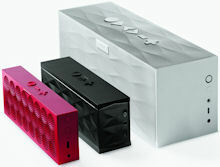 The Jawbone MINI JAMBOX is an impressive product, with great sound in a nicely portable design. It works well from the office to the living room to the patio. CyberLink's PowerDirector 12 video editing tool has evolved into a full up video editing tool, loaded with the latest technologies, and featuring impressive new capabilities like multi-cam editing (see previous post). CyberLink then includes PowerDirector 12 as part of its full Director Suite 2 for media creation. This not only has tools for audio and video -- AudioDirector 4 for audio editing and restoration and PhotoDirector 5 for photo editing -- but even includes ColorDirector 2 for color grading. And these still are priced in the consumer range: PowerDirector starts at $70, ColorDirector and AudioDirector list for $130 each, and the full suite is bundled for $300. These consumer prices do not mean consumer limitations, however -- ColorDirector and PhotoDirector now join PowerDirector with 64-bit support, and the video tools now support 2k and 4k video. See full article -- CyberLink PowerDirector 12 Review -- at Videomaker.com. Entries posted to Manifest Tech Blog in November 2013, listed from oldest to newest.